There is a Principle of Power in every person. By the intelligent use and direction of this principle, man can develop his own mental faculties. Man has an inherent power by which he may grow in whatsoever direction he pleases, and there does not appear to be any limit to the possibilities of his growth. No man has yet become so great in any faculty but that it is possible for some one else to become greater. The possibility is in the Original Substance from which man is made. Genius is Omniscience flowing into man. Genius is more than talent. Talent may merely be one faculty developed out of proportion to other faculties, but genius is the union of man and God in the acts of the soul. Great men are always greater than their deeds. They are in connection with a reserve of power that is without limit. We do not know where the boundary of the mental powers of man is; we do not even know that there is a boundary. The power of conscious growth is not given to the lower animals; it is mans alone and may be developed and increased by him. The lower animals can, to a great extent, be trained and developed by man; but man can train and develop himself. He alone has this power, and he has it to an apparently unlimited extent. The purpose of life for man is growth, just as the purpose of life for trees and plants is growth. Trees and plants grow automatically and along fixed lines; man can grow, as he will. Trees and plants can only develop certain possibilities and characteristics; man can develop any power, which is or has been shown by any person, anywhere. Nothing that is possible in spirit is impossible in flesh and blood. Nothing that man can think is impossible-in action. Nothing that man can imagine is impossible of realization. Man is formed for growth, and he is under the necessity of growing. It is essential to his happiness that he should continuously advance. Life without progress becomes unendurable, and the person who ceases from growth must either become imbecile or insane. The greater and more harmonious and well rounded his growth, the happier man will be. There is no possibility in any man that is not in every man; but if they proceed naturally, no two men will grow into the same thing, or be alike. Every man comes into the world with a predisposition to grow along certain lines, and growth is easier for him along those lines than in any other way. This is a wise provision, for it gives endless variety. It is as if a gardener should throw all his bulbs into one basket; to the superficial observer they would look alike, but growth reveals a tremendous difference. So of men and women, they are like a basket of bulbs. One may be a rose and add brightness and color to some dark corner of the world; one may be a lily and teach a lesson of love and purity to every eye that sees; one may be a climbing vine and hide the rugged outlines of some dark rock; one may be a great oak among whose boughs the birds shall nest and sing, and beneath whose shade the flocks shall rest at noon, but every one will be something worthwhile, something rare, something perfect. Principle of Power within them. There is a genius in every man and woman, waiting to be brought forth. Every village has its great man or woman; someone to whom all go for advice in time of trouble; some one who is instinctively recognized as being great in wisdom and insight. To such a one the minds of the whole community turn in times of local crisis; he is tacitly recognized as being great. He does small things in a great way. He could do great things as well if he did but undertake them; so can any man; so can you. The Principle of Power gives us just what we ask of it; if we only undertake little things, it only gives us power for little things; but if we try to do great things in a great way it gives us all the power there is. But beware of undertaking great things in a small way: of that we shall speak farther on. There are two mental attitudes a man may take. One makes him like a football. It has resilience and reacts strongly when force is applied to it, but it originates nothing; it never acts of itself. There is no power within it. Men of this type are controlled by circumstances and environment, their destinies are decided by things external to themselves. The Principle of Power within them is never really active at all. They never speak or act from within. The other attitude makes the man like a flowing spring. No greater good can come to any man or woman than to become self-active. All the experiences of life are designed by Providence to force men and women into self-activity; to compel them to cease being creatures of circumstances and master their environment. In his lowest stage, man is the child of chance and circumstance and the slave of fear. His acts are all reactions resulting from the impingement upon him of forces in his environment. He acts only as he is acted upon; he originates nothing. But the lowest savage has within him a Principle of Power sufficient to master all that he fears; and if he learns this and becomes self- active, he becomes as one of the gods. The awakening of the Principle of Power in man is the real conversion; the passing from death to life. It is when the dead hear the voice of the Son of Man and come forth and live. It is the resurrection and the life. When it is awakened, man becomes a son of the Highest and all power is given to him in heaven and on earth. Nothing was ever in any man that is not in you; no man ever had more spiritual or mental power than you can attain, or did greater things than you can accomplish. You can become what you want to be. 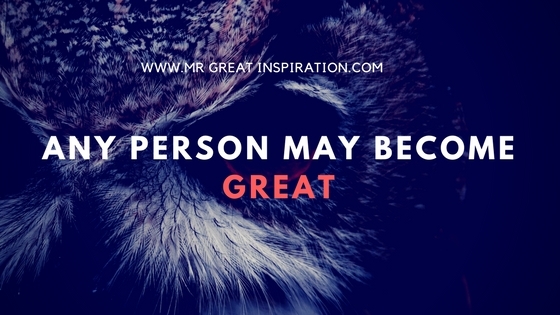 We hope guys you find our article "ANY PERSON MAY BECOME GREAT" by Mr Great Inspiration useful.